In central Switzerland, the Berner Oberland region is one of the most beautiful places I know. Grindelwald, Murren, and Wengen are the main tourist villages; Jungfrau, Mönch, and the legendary Eiger north face are the gigantic mountains. 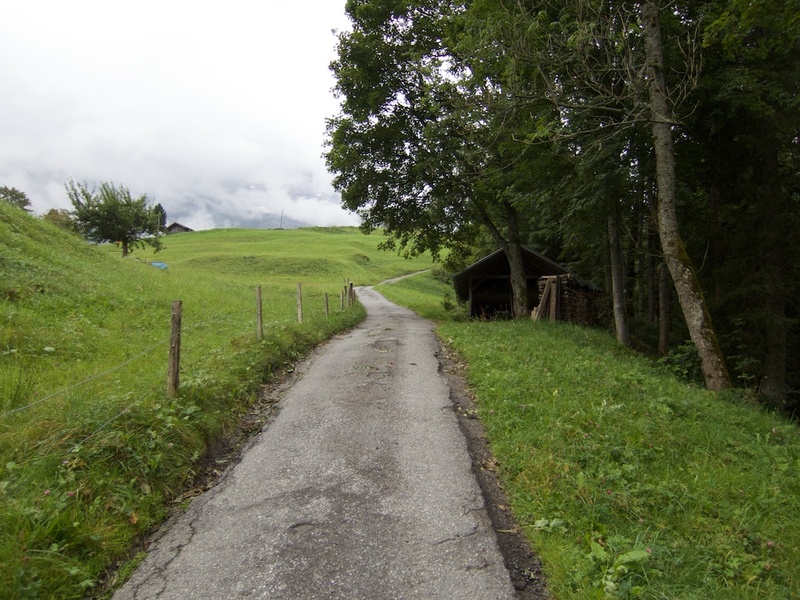 My favourite cycling here is either side of Grosse Scheidegg, and especially the lesser known trail above to First. 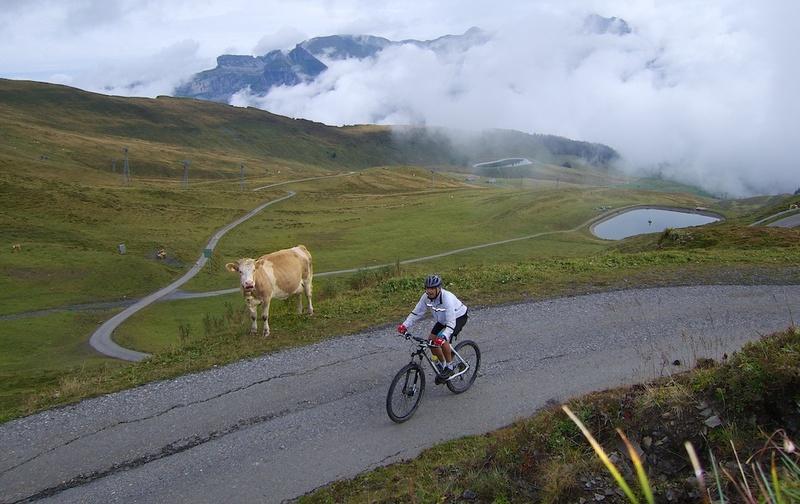 But the Lauterbrunnen valley, and the mountain bike trails to places like Klein Scheidegg or Murren are unbelievable. Any of the local tourist offices can give you helpful maps, and signed routes everywhere. Doreen and I had hiked or taken a cable car several times to Männlichen, but I had never cycled up. I used a mountain bike but this climb is perfect for a road bike. A good friend had told me the top stretch wasn’t paved – he was misinformed. The weather forecast was horrendous from early afternoon onwards. So it was either a rest day .. or I could get up very early. So I set the alarm. Just below Grindelwald, the ride starts at the start, and ends at the end, of the 3rd longest gondola cable car in the world (according to wikipedia). The first couple of kilometres I probably selected the wrong road. Super steep, crazy tiny path. But it soon joined up with the principle road. You should take the way I descended – see map below. This profile is of the main road (how I descended). Note: this is a challenging climb. Too Steep, take the main road. After a long, hard slog, I reached the summit and was rewarded with relatively clear views of the big mountains nearby (although the Eiger stayed hidden). I had nowhere to go but down, and the storms clouds weren’t yet forming, so I wandered off piste. I believe that is Jungfrau. There is an easyish hike between Männlichen and Klein Scheidegg that is beautiful beyond belief. Fine for walkers of almost any level. But bikes are forbidden – fair enough. I had few expectations for this ride given the weather. I knew it would be hard, but I was thrilled that I was able to get above the clouds. So beautiful here. 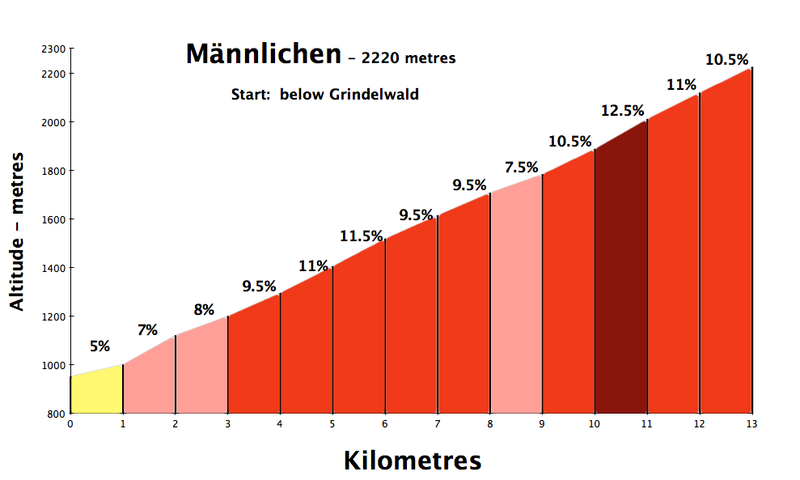 A very challenging climb, possible on a road bike. Expect almost zero traffic and plenty of cows. And plan this on a sunny day to see some of the most beautiful alpine peaks in Switzerland. A higher score on a sunnier day. “The first couple of kilometres I probably selected the wrong road. Super steep, crazy tiny path.” Yes, me the same :-)). By the way summit is not place on photo. You must take gravel road (still around 10%) rideable on road bike for almost 1 km. Finally you must push bike, but it’s only short stretch. Then you reach very top. Thank you for posting this. It brought back happy memories from when I rode this climb back in 1991. It was definitely tougher than Alpe d’Huez and the scenery was/is stunning. I was stopped by lots of cows on the way up but they just added to the experience. I have just discovered your excellent website and look forward to reading more of your posts.